Laura Ames, ’16 Elementary Education major and a Christian Ministries minor from Virginia Beach, VA.
Grove City College’s Early Education Center is situated within the main academic building, The Hall of Arts and Letters. Its purpose is to offer an outstanding education to preschoolers and also provide classroom experience for education majors. 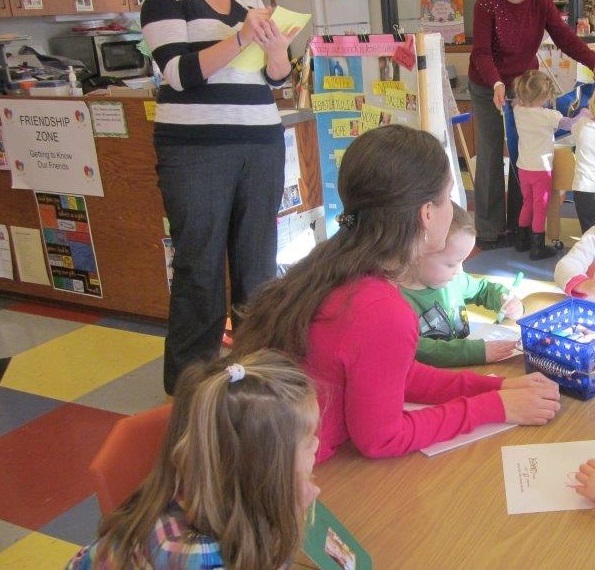 Every elementary education major spends at least one credit of a semester in the Early Education Center. Laura Ames, a senior Elementary Education major, sat down with me to tell me about her experience as an education major at Grove City and her time at the preschool. She has enjoyed the preschoolers so much that she has spent time in the Early Education Center every semester since sophomore year as a field student, student assistant or researcher. What are your responsibilities in the EEC? Field students’ main responsibilities are to interact with the preschoolers and provide one-on-one attention. We help the students focus on the teacher during the lesson and assess the developmental level of the preschoolers by talking about the theme of the day during the various activities. The Early Education Center is great for preschoolers because of all of the individual attention they receive and it’s great for us as the field students because we can apply what we have learned in the classroom. Field students also get the opportunity to teach their own lesson which involves picking a book, finding an engaging way to read it such as with picture cutouts and also picking two activities to go along with the book such as a song, movement game or craft. As education majors, we get the opportunity to teach a lesson as a freshman, well before our semester of student teaching. I remember being nervous, but it was a great learning experience and solidified my desire to be a teacher. After you teach your lesson, you get feedback from the head teacher. You learn what you did well and where you can improve. The EEC provides a safe environment where you can watch lead teachers and learn how they engage with the students and manage the classroom. What is your favorite part of your experience in the EEC? My favorite part of my experience in the EEC is working with the children and their contagious excitement for learning. It has been a great reminder to why I am studying and working so hard in my classes. It has also been exciting to see how much the children change and grow in a short amount of time. I remember meeting a shy little boy my sophomore year and now a few years later he has completely come out of his shell and is excelling in school. What is the most challenging part of working in the EEC? The biggest challenge I have faced as an education major is juggling being a student and a pre-service teacher. I go from a few hours in the preschool to college classes and studying. It can be hard finding a balance in being both a college student and a teacher at the same time. How did Grove City College prepare you for this experience? We learn teaching and classroom management best practices in our classes, but field experiences allow us to observe teachers actually executing them and it also enables us to apply them ourselves in the teaching our own lessons. My education psychology classes taught me the developmental stages of children and what to expect at each stage and I was able to see this in the EEC classrooms and assess children’s development levels in order to better help them. How will this experience prepare you to be a teacher? The EEC opened my eyes to how much I enjoy preschoolers. I even volunteered a semester in the preschool because I enjoyed the students so much. All the field experiences that Grove City requires help you figure out what grade you are best suited to teach. Education majors are in the classroom from day one of their college experience and spend countless hours interacting with students. I am grateful for the education department at Grove City College and their commitment to graduating confident and prepared educators. To learn more about Grove City College’s Education department, check out their website! Megan (’16) is a marketing major at Grove City College. She is the president of GCC’s chapter of the American Marketing Association and is passionate about working with people and marketing communications. Her interests include writing, traveling, running and coffee.